This week a wonderful new movie comes out called "HUGO" based on the book, The Invention of Hugo Cabret by Brian Selznik. I first learned of the book from a fellow performer who raved about it. I decided to pick it up and read it and I too found the book to be fantastic. There were many elements about the book that fascinated me. For one, I was struck with how well the author had weaved a true story together with a fictional story. If you've not read the book, nor watched the movie, let me tell you about the true part of the book. One of the main characters is a man named George Melies. He was quite real. He was born on December 8th, 1861 in Paris France. His father was a shoe maker and together with his two brothers he was trained in that business. He learned the craft of shoemaking while in London. It was also in London that young George Melies visited Maskelyne and Cooke's famous magic theatre. His desire to stay in the shoe business changed and magic became his new obsession. 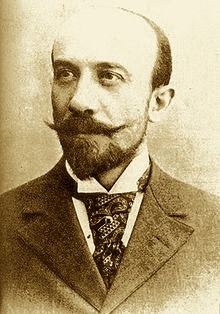 He studied with the Parisian magic dealer Voison and eventually even started building his own apparatus and automaton. Then in 1888, the opportunity of a life time came. A little theatre went up for sale and George Melies left the shoe business for good to become a professional magician. 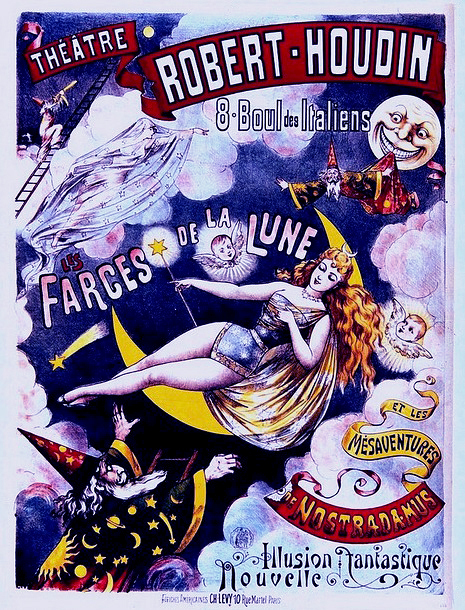 Years before, Robert-Houdin made magic a popular form of sophisticated theatrical entertainment in Paris and this was followed by other great French magicians, like DeKolta and Felician Trewey. The theatre that Melies bought was none other than the famous Robert-Houdin Theatre! He began to present magic shows in this historic location. In 1895, Melies witnessed a demonstration of a new invention by the Lumiere Brothers called the Cinematographe. This was an early movie projector and Melies saw moving pictures for the first time. Though it must be pointed out that the very earliest movies were very short and were merely quick shots of a train pulling into a station, or people walking on a street. The early movies had no plot, no story, not what we think of today as movies. Melies saw the potential of this new invention and tried to purchase it from the Lumiere Brothers but they turned him down. Luckily for Melies, other people in Europe and abroad were working on similar inventions and after seeing another version of a projector in London, Melies created his own. By 1896, he was making movies and not the boring kind. His movies were interesting. 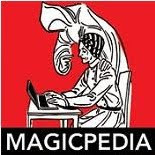 In fact, his early movies were recreations of his magic routines. 'The Vanishing Lady' was one such movie. This was based on DeKolta's famous illusion by the same name but Melies discovered that he could use the camera and the film to create the illusion rather than special props. This would become Melies great contribution. He created and discovered many special visual techniques and uses of animation that we would call today 'Special Effects'. Today he is known and revered in the Motion Picture community as The Father of Special Effects. 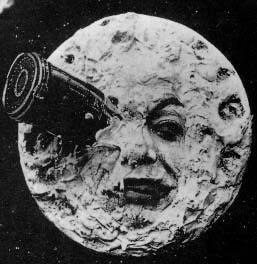 His most famous movie was called Le voyage dans la Lune or A Trip to the Moon which he made in 1902. This movie figures prominently in the HUGO movie by the way. A Trip to the Moon still exists today. Based on two stories by author Jules Verne, A Trip to the Moon was the first science fiction movie ever. Before the people who made Star Wars and Star Trek were ever born, Melies put out A Trip to the Moon. It was hugely successful. Unfortunately, it made money for just about everyone other than Melies. The movie was copied and shown without Melies permission. In America, Thomas Edison's film company was showing the film all across the country and making money off of it. Melies made over 500 films in his lifetime. But despite his innovations and contributions to the industry, his film company went out of business in 1913. 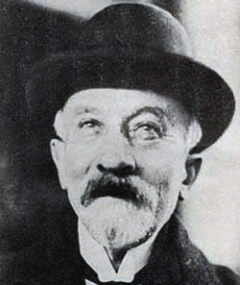 In the later years of his life, Melies worked at a booth in a train station selling toy trinkets and was bitter about his involvement in movies. It wasn't until the 1930's that people in the film community started to recognize Melies for his achievements and he was awarded the Legion of Honor award by none other than Louis Lumiere, one of the original Lumiere Brothers who first sparked Melies interest in movies. George Melies died in Paris in 1938, and is buried in the Père Lachaise Cemetery along with other such notables as Edith Piaf, Oscar Wilde, and Marcel Marceau. UPDATE: I just heard that HUGO the movie received 11 Oscar Nominations! I'll be pulling for HUGO this year!!! !Nominations include: Best Picture, Best Director, Cinematography, Art Direction, Costume Design, Film Editing, Music (Best Original Score), Sound Editing, Sound Mixing, Best Visual Effects, Best Writing (Adapted Screenplay). Just sorry none of the actors received nominations. NEW UPDATE: I hadn't made this connection before, but here is another interesting bit of fact that connects to the movie. In the movie, Hugo's father dies in a museum fire along with the automaton. Well, in real life, Robert-Houdin's Hand Writing and Drawing Automaton was in Barnum's American Museum in NYC. That museum burnt to the ground and along with it, the Hand-Writing Automaton that was created by Robert-Houdin. This may have likely been another source of inspiration for the author. Top story for November after only a couple days!!! This article was on the fast track to #1, it hit the top ten pretty quickly and then edged up as far as #2 and got knocked down to #3 by the Pendragon article which took the #1 spot. 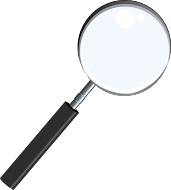 Nice to read this article.I have bookmarked your blog, the articles are better than other blogs.I like your language and writing style.Thank you so much for sharing this article.